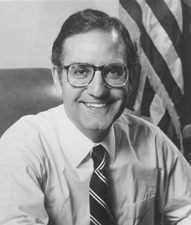 MITCHELL, George John, a Senator from Maine; born in Waterville, Kennebec County, Maine, August 20, 1933; attended the public schools; graduated, Bowdoin College, Brunswick, Maine, 1954; graduated, Georgetown University Law Center, Washington, D.C., 1960; served in the United States Army Counter Intelligence Corps, Berlin, Germany, 1954-1956; admitted to the District of Columbia and Maine bars in 1960 and commenced practice in Portland, Maine, 1965; trial attorney, Antitrust Division, Department of Justice, Washington, D.C., 1960-1962; executive assistant to Senator Edmund S. Muskie 1962-1965; practiced law, Portland, 1965-1977; assistant county attorney for Cumberland County, Maine, 1971; unsuccessful candidate for governor of Maine in 1974; United States Attorney for Maine 1977-1979; United States District Judge for Maine 1979-1980; appointed on May 17, 1980, as a Democrat to the United States Senate to fill the vacancy caused by the resignation of Edmund S. Muskie for the term ending January 3, 1983; sworn in May 19, 1980; elected in 1982 and again in 1988 and served from May 17, 1980 to January 3, 1995; not a candidate for reelection in 1994; chairman, Democratic Senatorial Campaign Committee (Ninety-ninth Congress); co-chairman, Democratic Policy Committee, Democratic Conference (One Hundredth through One Hundred Third Congresses); majority leader (1989-1995); Special Advisor to the President and the Secretary of State for Economic Initiatives in Ireland (1995-2000); chairman, Sharm el-Sheikh International Fact-Finding Committee to examine crisis in Middle East (2000-2001); engaged in the practice of law in Washington, D.C. (1995-); awarded the Presidential Medal of Freedom on March 17, 1999; appointed by President Barack Obama to serve as Special Envoy for Middle East Peace (2009-). Mitchell, George J. Making Peace. New York: Knopf, 1999; Mitchell, George J. Not for America Alone: The Triumph of Democracy and the Fall of Communism. New York : Kodansha International, 1997; Mitchell, George J., with William S. Cohen. Men of Zeal: A Candid Inside Story of the Iran-Contra Hearings. New York: Viking, 1988.